Known as the synthetic version of the tetrapeptide epithalamin, which naturally occurs in the pineal gland in our body, Epitalon (also known as Epithalon or Epithalone) was first discovered in the late 1980’s by Prof. Vladimir Khavinson from The Sankt Petersburg University, Russia. The life extension and anti-aging properties of the synthetic tetrapeptide Epitalon (telomerase activator) are remarkable. As the most prominent tasks of the pineal gland are to maintain different kind of processes in our body, such as to normalize the activity of anterior pituitary and to maintain the levels of calcium, gonadotropins, and melatonin, its activity is highly regulated by a series of feedback mechanisms. Epithalamin acts as an antioxidant and increases the resistance to stress and lowers the levels of corticosteroids. Over the years, Prof. Vladimir Khavinson has conducted extensive studies on mice and humans and has come across interesting conclusions, supporting evidences such as anti-aging, telomerase activation and elongation of telomeres due to Epitalon action. Gene expression is different in young, middle-aged, and old individuals. The body times the life cycle using gene expression. In childhood, genes dictate the body to grow, in the middle age they maintain the body strong and healthy, and in the old age they dictate the body to stop releasing vital hormones, thus slowing down life processes and destroying the body. Telomerase (a.k.a. telomere terminal transferase) is the enzyme capable to elongating telomeres in human bodies while protecting the DNA from the damage caused by aging. When cells multiply, they are set a predefined number of cycles they can perform the divisions due to the permanent curtailment of telomeres. In Mr. Khavinson’s studies, Epitalon treated cells made a total of forty-four passages (ten extra divisions compared to normal cells). 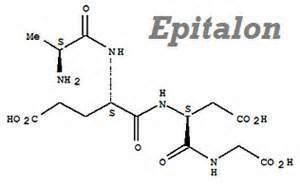 Thus, the studies support the evidence that Epitalon prolongues the life of cells due to overcoming of the Heyflick division limit. (Reference: V. Khavinson et all. in Bulletin of Experimental Biology and Medicine. June 2003, PMID: 12937682). Similar to thymalin (found to stimulate gland thymus re-growth and to rejuvenate the immune function), epithalamin is a sequence of four amino acids. The structure of Epitalon is: Ala-Glu-Asp-Gly. Epitalon decreases the age-related changes in the immune and the neuroendocrine systems, reducing the incidence of chronic diseases and infections. Similar effects have been observed in patients treated with thymalin but at lower extent. (Reference: V. Khavinson et all. in Bulletin of Experimental Biology and Medicine. March 2002, PMID: 12577695). Twelve months studies conducted by Prof. Vladimir Khavinson in patients showing advanced level of accelerated aging demonstrated normalizing effect on metabolism and the improvement of overall health condition. Following ten days of treatment, elevated cholesterol, uric acid and alkaline phosphatase levels have returned to normal and maintained stable for several months. The elongation of telomeres, thus the protection against cancer and other age-related diseases. Regulation of the nouroendocrinous system. Studies carried out by Prof. Vladimir Khavinson have reported no side effects associated with the administration of Epitalon. Epitalon users on various Internet forums have also reported no side effects. Due to the short length of the amino-acidic chain, Epitalon is administrated orally, nasal spray drops or injectable (by far the most effective method) in 10 – 20 days-in-row cycles. Epitalon comes as a lyophilized powder. It is recommended to inject 1 – 2ml of sterile or bacteriostatic water into the vial and mix gently. Although stable at room temperature for ninety days in lyophilized form, once reconstituted, the solution should be kept refrigerated between 2 – 8 degrees Celsius for maximum 20 days.